But for how long? Enjoy the sunshine while it lasts, I say. Lovely long weekend...highlights include a massage!! 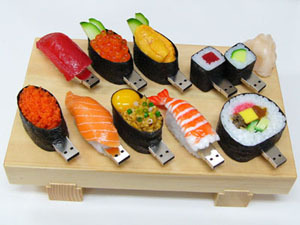 And Dan took me to sushi...mmm...speaking of sushi, check out these sushi USB drives -- thanks Pamela! -- aren't they cute? I think they're hilarious. Oh! And we saw goats in San Francisco! About 30 of them, on a hillside between Glen Park and Miraloma. Sitting in the rain and munching. I guess they're clearing out the brush.